Sunscreens confuse me. They’re full of toxins…should I bother with it at all? Zinc? (oooh, but the nano-particles?! )…You too? Good. I did some scouting, asked experts and here’s what I found…just in time for Australia Day!! A lot of the sunscreens out there do NOT protect us against harmful UV rays, plus they can contain chemicals that affect our hormones, damage our skin, and sometimes increase the risks of skin cancer. Oh, the tedious, messy, modern-life irony of it all! Today’s post is going to try to get to the bottom of the sunscreens that are purposeful AND harmless. Getting sun, without sunscreen, is actually good. Better than good actually. Recent studies reveal that people who spend more time outdoors without getting sunburnt, actually decrease their risk of developing melanoma. The benefits of Vitamin D exposure (which can only be reaped without sunscreen) actually protect against many types of cancer; including breast, colon, endometrial, esophageal, ovarian, bladder, gallbladder, gastric, pancreatic, prostate, rectal, and renal cancers, as well as non-Hodgkin’s lymphoma. Indeed, more people die of Vitamin D deficiency-based cancers than from melanoma. I’ve written about it previously here. Get sun every day, but only for 20-40 minutes at a time and, if you’re in Australia, before 10am and after 5pm. physical sunscreens, containing either zinc oxide or titanium dioxide, which form a film on top of the skin that reflects or scatters UV light. These are your best option. chemical sunscreens, which absorb UV rays before they can do damage. 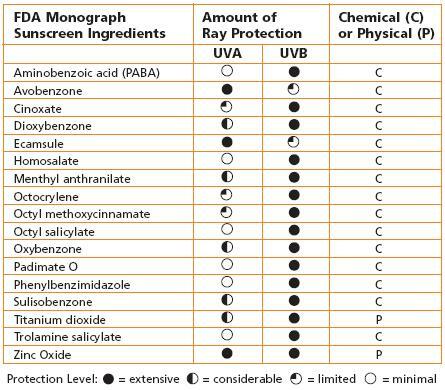 The Environmental Protection Agency‘s graph below features chemical and physical sunscreen ingredients, as well as the type and amount of ray protection that they provide and their class. Note how zinc oxide fares. don’t want zinc? what next? If you’re going for a chemical sunscreen, you need to know this:While chemical sunscreens can protect against damage from UV rays, they can also contain a host of nasty chemicals which are all absorbed through the skin and end up circulating your blood stream. Not Good. 1. Always check the label. Worst offenders? Dioxybenzone and oxybenzone. These two are some of the most powerful free radical generators around as they can disrupt hormone function. What about PABA? Para-aminobenzoic acid (PABA) is common in many sunscreens, acting as a dye that absorbs ultraviolet B (UV-B) light in much the same way as oxybenzone. PABA contains a benzene ring in which electrons can shuffle, or resonate, between different locations within the six-sided structure. This electron dance matches that of the lightwaves of UV-B rays, absorbing and blocking UV-B energy by converting the light to heat. PABA releases free radicals, damages DNA, has estrogenic activity, and causes allergic reactions in some people. You can read more here and here. Also … octyl methoxycinnamate: The main chemical used in chemical sunscreens to filter out ultraviolet B light is octyl methoxycinnamate. OMC kills cells in mice even at low doses. OMC’s also particularly toxic when exposed to sunshine….so a double whammy of stupid pain! Finally Benzophenone: Nicole Bjilsma, a naturopath, acupuncturist and building biologist, recently blogged about BP, a sunscreen ingredient which prevents sunlight from breaking down the products in the sunscreen. Nicole says it’s a hormone disrupting chemical that interferes with thyroid function and lowers testosterone, and there are serious concerns about its impact on male fertility. You can follow Nicole’s blog here. 2. Check your sunscreen rating on the EWG. The Environmental Working Group rates sunscreens (amongst other things) based on safety and how well they protect against UV rays. You can download EWG’s handy tipsheet on what chemicals to avoid in the beauty aisle. But, the info is geared towards the US market. Australia has different regulations (SPF limits etc) and the great majority of the ones the EWG recommend are not available on the Australian market. so what brands to buy? Me, I don’t use sunscreen on my face. I use Wot not on my body. But to be honest, this is only when I’m out in the middle of the day. however it is thick and greasy to apply. Here is a link to my article on sunscreens. (although it is actually SPF 27, we can’t claim it as such because it’s not classified as a primary sunscreen). I recommend you also check out Jess’ recent blog post on the best natural body care brands. They are physical blockers (zinc) but don’t go too white, and haven’t got nanotechnology in them. * Dec 2013: Sadly, Friends of the Earth are not prepared to recommend any sunscreen at the moment, as all those sent for testing of nanoparticles came back unsafe. You can read more here. so, what about nano technology? To date, the current weight of evidence suggests that nanoparticles do not reach viable skin cells; rather, they remain on the surface of the skin and in the outer layer of the skin that is composed of non-viable cells. However, Australia’s Cancer Council says on it’s website that while it takes into account the TGA findings, it’s sunscreens do not contain any nanoparticles. *updated July 2012. Thanks to a reader who directed us to this article, which states that at least 10 Australian sunscreen brands claiming to be ‘nano-free’ have inadvertently been using nano-materials in their products, causing at least one to be recalled. I DO NOT advocate burning. In fact – as Jo will attest – I abhor it. But, if you get caught out, a home remedy for soothing painful sunburn is right in your kitchen cupboard – apple cider vinegar. Soak a cotton ball or small sponge in apple cider vinegar and dab it on the burned spot, or make a compress for larger areas. If severely burned, repeat two to three times a day. If you are sunburnt head-to-toe, it’s best to take a bath in the stuff – simply add 2 cups of apple cider vinegar to the tuba and soak for at least 15 minutes. Apple cider vinegar applied to skin effectively neutralizes the burn, relieves pain, and prevents blistering and peeling. Note: you may smell like a pickle, but a little coconut oil will remove most of the odor, plus add moisture to your skin. I’ve blogged on the benefits of coconut oil before. You can read more about that here. Hope that helps…feel free to add your own advice or tips…. I just adopted a hairless Chinese Crested dog who needs sunscreen. Zinc oxide is very toxic for these dogs and I’ve been reading so much scary information about the chemicals in our sunscreens. I was told titanium dioxide is OK but can’t seem to find a safe sunscreen without the harmful chemicals. I live in Florida and the sun is very intense so much of the day that I really hate putting his pajamas on him for sun protection. They do cover almost all of him. I welcome suggestions. Please update your article to include the 2014 studies showing that even if nanoparticles are absorbed into the skin, our macrophages are able to break them down before they reach the bloodstream. I could be wrong, but last time I checked the periodic table, Zinc was listed as an element, ergo it is a chemical, thereby making any zinc based sunscreen, a chemical one. Do you have any references for how coconut ingestion acts as a form of sun protection? I could almost believe the idea has merit given my sub continental heritage and lack of skin burn, but we still deserve to see the references. Please also include references to any medical experience you have, as you seen to be very free in giving out health advice. And no, naturopathy is not medical! Oh, wait. Sarah Wilson has no medical credentials. So before you stop using sunscreen and increase your risk of skin cancer, just dwell on that FACT for a moment. Agreed. its great to have so much info on sunscreens in one spot but it would be better if it was backed up with hard science not just opinions of people who sell things. I have vitiligo, we are often told to use heavy sunscreens but for me it has just increased the vitiligo! so I definitely empathise with the whole “clean sunscreen” idea and appreciate the effort in the research…But I am sitting here researching a melanoma assignment looking at stats and I think it’s a little irresponsible of Sarah infers that you’re only at risk of melanoma if you burn. Untrue. its’ cumulative or repeated exposure. There are certain skin types that are at risk every time they step outside. physical coverage is the only way. from what I read so far melanoma would get someone way before the chemicals in the sunscreen did. don’t tell people you don’t wear sunscreen because chemicals but you are happy to dye your hair. (which can cause bladder cancer). Unqualified people with large audiences need to have 32pt font disclaimer that they are unqualified to give publish scientific information or medical advice. Wotnot contains fragrances in their sunscreen named naticide so I personally don’t recommend this sunscreen for anyone with sensitive skin. Sure going “white” might not be all that appealing but the aim here is to not get burnt! Melanoma or whiter skin? Hmmm I think ill go for the whiter skin for a few hours thanks. Also to actually advise to be out in the sun at 8am-10am without sunscreen for 40 mins is very very irresponsible. Its definitely possible to get burnt at that time and I don’t recommend it, especially in the Australian Summer. Stop spreading utter nonsense like carrots can protect you from skin cancer. I don’t care if your friend said it, not you, it’s your site and despite all your other great work, stuff like this is really disappointing. Also, see knew Vitamin D guidelines. This post needs an update. You need to check your facts before mouthing off jess. There are certain algaes that protect themselves from the sun, they use a similar compound to carotene. So the carotene in carrots and other plants could be used. Fact! I thought “octinoxate” was a NOT GOOD THING?? Thanks so much for the in-depth knowledge, the solid resources and the variety of other knowledgeable viewpoints! Invaluable!! melanoma. But you make essentially no vitamin D,” Dr. Holick warns. Great list! I think Zinc is the best sunscreen ingredient. I was just reading about Zinc It Over – the over makeup sunscreen. Have you tried that one? I love mists. Lavinlia has a pretty good topical sunscreen, it’s natural.